Discover the spellbinding magic of Swan Lake in this musical retelling of the ballet - push the button on each beautiful scene to hear the vivid sound of an orchestra playing from Tchaikovsky's score. This tale of a prince, a beautiful swan princess and an evil sorcerer begins in a woodland clearing far, far away. It is Prince Siegfried's 21st birthday. He is playing games with his friends when his mother, the Queen, arrives to tell him he needs to stop having fun and start looking after the kingdom. Prince Siegfried dreams of running away. He follows an enchanting flock of swans to a clearing by a lake, where four of the little cygnets begin to dance. The most beautiful swan transforms into the Princess Odette, who tells him that she has been cursed to turn into a swan by day and return to her natural form at night by the evil sorcerer Von Rothbart. As the prince and Odette dance, they begin to fall in love. The story follows Prince Siegfried as he attends his birthday party, is tricked into proposing to Von Rothbart's daughter Odile and returns to the lake to battle the evil sorcerer. Will the prince be reunited with his swan princess? As you and your little one journey through the magical scenes, you will press the buttons to hear 10 excerpts from the ballet's music. At the back of the book, find a short biography of the composer, Pyotr Ilyich Tchaikovsky, with details about his composition of Swan Lake. Next to this, you can replay the musical excerpts and, for each of them, read a discussion of the instruments, rhythms and musical techniques that make them so powerful. 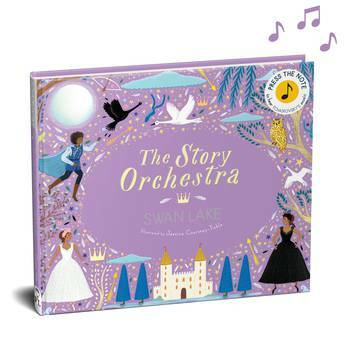 A glossary defines musical terms.The Story Orchestra series brings classical music to life for children through gorgeously illustrated retellings of classic ballet stories paired with 10-second sound clips of orchestras playing from their musical scores.Manufacturers note: please pull the white tab out of the back of the book before use. Sound buttons require a firm push in exact location to work, which may be hard for young children. All sound clips are 10 seconds long. KATY FLINT is a childrens book author and editor, based in London. She is the author of the best-selling sound book The Story Orchestra: The Nutcracker, and has worked on many other non-fiction titles - from human bodies to dinosaurs. She likes playing the violin and dog-spotting.